English AOR sensations ESCAPE are proud to reveal their new frontman Rick Chase. 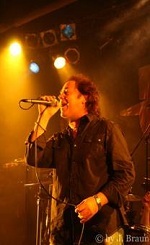 Rick will be known to many of the AOR community as the former lead singer from Alibi whose 2008 album Voice of Reason was released by Z Records.. ESCAPE believe that the addtion of Rick Chase to the bands line up with his fantastic stage presence and superb vocal range will further develop the bands melodies even further. Rick is currently writing with the band for their third studio album. "I feel excited to be the new lead vocalist of ESCAPE. A new album in the pipeline and live dates later this year. Bring it on!" Due to the proximity of the forthcoming previously planned shows in May, Escape are currently rescheduling and adding further dates which will be announced shortly. In addition festival appearances will be announced in a few days time. The arrival of Rick Chase to the ESCAPE ranks is due to the departure of Stevie K whom is pursuing a new project. The members of Escape and staff at Z Records wish him every success for the future.